It's Duck Soup: "Borrrrrn Freeeeeee!" Quats freaking out in an empty house. Compare with earlier photo of the same space. By Tuesday night I was emotionally and physically exhausted. As I got up and set about getting ready for the auctioneer and his crew to arrive for their third day of stripping the house, I felt as if this had been going on for months, years. It felt endless. 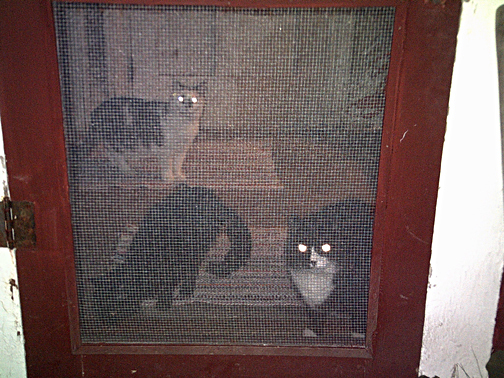 The cats no longer fought to get out when I locked them away. My father was the first to arrive. His wife was already out looking at houses with the real estate agent. It was a quarter to ten before the trucks started showing up. They had left bins of things in the front room of the house. I volunteered to help carry them out, but I had only made two trips before I completely fell apart and had to go hide in the barn. My father found me there and hugged me. By lunchtime, my father's wife was back. Mr. J_____ invited us three to lunch at a little restaurant in Albion. I am sure that he wanted to regale us with more of his stories, but the entire lunch was co-opted by my father and his wife, and her report of the houses she had seen. My father picked up the tab. Sometime in the middle afternoon Mr. J______ stopped sorting items and entered the house. I believe he was determined that this was going to be the last day of his involvement. He went down the basement and all through the house, searching for value. He opened every door, including ones that were off limits. More on that later. Among the things he found that he seemed to want were the boxes of my old shop stock from the Duck Soup days, ten or eleven big boxes full of comic books dating from 1982 and earlier. I couldn't believe that he really wanted them, but this part actually pleased me: I had been wondering how in hell I was going to get rid of the things. They will be auctioned off as a lot, included as part of the estate. At some point I found myself in the front hall, looking into the study. My desk and everything on it were there, my computer was on its stand as normal, the sofa was against the wall. Everything else was gone. When they had taken down the painting over the fireplace, all of the plaster had come down with it and was piled up on the floor and mantelpiece. On the outside wall, a horrible amount of water damage had been exposed. The same was true in the living room. Plaster and paint chips everywhere. When I looked up the stairs, I was shocked to see that Pandy Bear and Whitey were both out. They were starting down the stairs. The front door was open behind me. I leaped forward at them and they split. Whitey ran back into the bedroom. I shut the door behind him. Pandy had gone off towards the bathroom. I ran down and slammed the front door shut. When I went back to look for Pandy Bear, I saw that the doors that are usually closed, leading all the way through the back of the house, to the back stairway and the entry hall downstairs, were all standing open. No sign of Pandy Bear. I ran down through the house and got to the back door just as Pandy was stepping outside. As I reached for him he took a fright of my action and what was happening in the yard, and ran off at high speed for a big fatty-bounce of a cat. He ducked into the bushes and dove into the hole that goes under the barn. He was gone. I screamed at the workers. "Is there anything we can do to help, Doug?" Bill G___. said. What a stupid question. I went around the house calling for Pandy, but there was no sign of him. When the day started to wind down, Mr. J____ walked me through the upstairs of the house, which was largely untouched. He said the beds and other furniture up there were not worth much of anything, maybe $50 - $150 a piece. His brother in law would be around in two or three weeks to remove them for his auction, but Mr. J______ advised me to keep them unless I was certain that I would not need them. They would not bring much at auction, and would be more expensive to replace. He left. His crew finished packing. By five o'clock I was signing the final contracts, twelve or thirteen pages. The trucks drove off. All the grass in the yard was mashed down. The place was quiet and empty. Pooky wandered through the house crying her head off, trying to absorb what had happened. Patches was totally cool and copacetic. There was no time to look for Pandy Bear. My father and his wife had made a six o'clock appointment to look at houses. This time, I drove myself. We picked up the agent -- Sue's husband Harold -- and drove to a house I had never seen before, in a good neighborhood. It was a plain white house with a screened porch for my kitties, sitting on a crazy knoll across the street from the Catholic Church. The garage was in poor condition, but inside it was nice, if on the small side. Very small, actually. I was conscious of feeling cramped even though it was unfurnished. The bedrooms upstairs were a little bigger than the closets in my mother's house. Not all the furniture that I retained would fit. Still, I could envision myself and the cats there. It would be a little on the cozy side, but it could be done. But that horrible carpet would have to come up. and the green paint in the kitchen would have to go. Then we went up to the cute brown-shingled house that I had been looking at for so long. This was different. It was beautiful inside, and just the right size. I quite liked it. But the porch had a bounce and a droop in it and the screens were loose, and the house needed a lot of work: new shingles. Structural work. This did not phase me as much as it did my father. The deal breaker for me was the bathroom situation. There was just one bathroom in the whole place, and it was a horrible cramped thing, too small for me to fit a cat tray inside. It would be impossible to sustain five cats. So it appeared the small white house was my only option, and I began to feel a little depressed at the thought. We dropped off Harold, a very nice man, at his office and went up to MacDonald's for dinner. There we talked over the options, and they decided to come over to the house the next day to help me work on it. They said that they would investigate the Victorian that was For Sale By Owner on their way out. The niceness and the helpfulness of everything they were doing for me actually made me feel uncomfortable. I drove home in full dark with such mixed emotions, not all of them sad. There was no sign of Pandy Bear.